As one of the most energy efficient roofing options, foam roofs are fairly common in Arizona where keeping as much cool air inside the home is key to avoiding costly electricity bills. Foam roofs are also very lightweight and long-lasting, which helps to minimize structural stress while maximizing the return on your roofing investment. Spray foam can be installed directly onto the roof deck, or in some cases, over an existing roof system. Applied as a liquid, the foam expands as it dries, which allows it will fill cracks, deficiencies, and penetrations while creating a very effective water-tight seal. 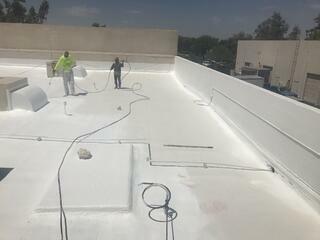 The foam roofing system consists of a one-inch thick closed cell polyurethane spray foam followed by a special UV reflective layer that guards against Arizona’s harsh climate and extends the polyurethane’s lifespan. A recommended re-application of the UV layer every 7-10 years (or more depending on the quality of coating selected) will dramatically extend the foam’s lifespan even more – allowing it to serve nearly as long as the structure is standing. Sprayed Polyurethane Foam is a combination of isocyanate and polyol. These two components are fed through a proportioner, which heats then pumps the two separate components to the spray gun, where they are mixed and sprayed onto the substrate. Because it is sprayed onto the roof as a liquid, it forms a single continuous structure that is seamless and very stable. SPF requires a clean surface for proper application. It must be dry, free of contaminants like oil, and properly fastened to the substrate in accordance with the proper building codes. Finally, a protective elastomeric top coat is required, which is typically sprayed on as well. Seamless: Applied as a single monolithic membrane without seams or joints to leak or fail. Easy Additions: SPF is easy to tie into when stacks or other roof penetrations need to be moved or added. Self-Flashing: Easily applied to irregularly shaped roofs, penetrations, curbs and parapets. Lightweight: Typical system weight is 50 lbs per square, versus over 100 lbs for single-ply roofs and 400 lbs for a built-up roof. Energy Efficient: SPF has the best insulating properties available for commercial construction today. Saves Time and Money: For most installations, no tear-off is necessary and insulation can provide substantial cost savings on air-conditioned buildings. Warranties: 10, 12, 15, and 20 years full system labor and material warranties available. Reduces Rooftop Ponding Water: SPF can be shaped to all taper or slope to troublesome rooftop ponding water areas to reduce or eliminate standing water.